"The Diocese for Western Europe of that Old Calendarist Greek Orthodox Church which (after receiving a Hierarchy with the aid of Bishops of the Russian Orthodox Church Outside of Russia) was united under Archbishops Akakios and Auxentios. This Diocese was granted a Tomos of Autonomy as a Synod for the Western World in 1984 from Archbishop Auxentios in order to pursue missionary work among the non-Orthodox people of the West. The title of the Synod at this time was the Metropolia of Western Europe. After the transference of its first Chief Hierarch, Metropolitan Gabriel of Portugal, to the Autocephalous Church of Poland, Bishop Evloghios of Milan was chosen as second Chief Hierarch. Ten years later, Metropolitan Evloghios remains at the helm of the Holy Synod of Bishops. The Milan Synod uses the Julian calendar exclusively, and firmly resists the heresies of false ecumenism and trans-religious syncretism." Within the formation of Orthodox parishes in Western Europe and the Americas over the last century, one finds two strains of thought, both of which have a legitimate place in Orthodoxy due to the ecclesial realities of missionary migration and ethnic reawakening to long-lost Christian heritage. One can find these two roles in the Russian Saint Innocent of Kamchatka and the Aleutian Islands, who wrote the first document, a Christian catechism, in a Native American Language, and Dr. Joseph Overbeck, a former Roman Catholic priest who established the practical ecclesiological basis for a native Western Orthodoxy to form. 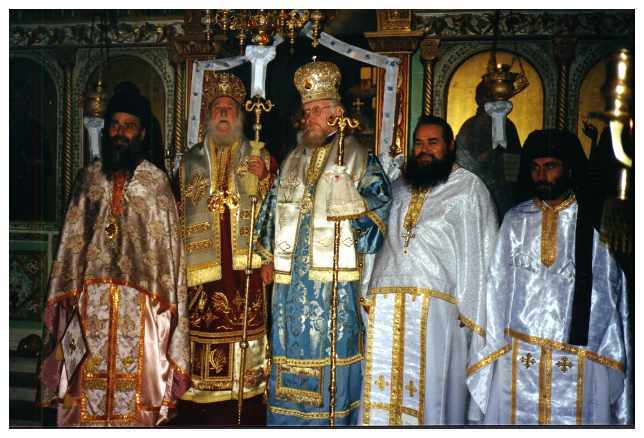 From this history, detached somewhat from the tragedy of the Russian Revolution and the Western experiments of the Antiochian Archdiocese in recent decades, comes forth the story of the Holy Synod of Milan. But, first, we need a little additional background. In the 20th century, Orthodox Christianity began to experience many profound assaults upon its very nature. We can often label these assaults into three general, distinct, though, connected, categories: 1) Ecumenism, 2) Modernism, and 3) Sergianism. Orthodox Christianity teaches that the Orthodox Christian Church is the One and only True Church Founded by Our Lord God and Saviour, Jesus Christ. As such, we seek to propagate the Gospel and Apostolic teachings to all men, so that all might come to the truth and be saved; noting that, as Our Lord Jesus Christ taught, "He who endures to the end will be saved." The Orthodox Christian life is a continual working out of our salvation with fear and trembling, until we come to, through repentance and struggle, to the place of the Blessed, Paradise with Christ, and, after, to the Heavenly City, the New Jerusalem, after the Resurrection and Last Judgment. For these reasons, the Holy Church, the Body of Christ, gives us the Holy Mysteries of Baptism, Chrismation, and the Eucharist, and, when Her members fail, we have the Mystery of Confession and the Mystery of Unction; we have also the Mysteries of Holy Orders and Matrimony for continuation of the Sacramental life, as well as many other sacred rites, such as Monasticism, Blessing of Water, etc. By the Grace of God in the Holy Mysteries, and the prayers of Our Sovereign Lady, the Holy Blessed Theotokos and Glorious Ever-Virgin Mary, with all the Saints, and in conformity with the Holy Scriptures, Councils, Fathers, Saints, Sacred Services, we live the Orthodox Christian life. Because the Church wishes to safeguard Her Holy Apostolic Tradition, since sound doctrine provides salvation, keeping safe those within Her Bosom, Guarding the Apostolic Deposit, keeping the Dogmas of the Faith pure, not only for those within, but also for the sake of those outside, so that they may find a place of refuge in the Church, the Ark of Salvation, the Church thus continually battles the great enemy of mankind, the evil one, the devil and his hosts of fallen angels, as well as teaching Her members to resists the sins of the flesh and the world. The devil goes about, as St. Peter said, as a roaring lion, seeking whom he may devour. The devil and the demons attack man, but, with God's Grace, if we resist him, he will flee. For all these reasons, the Church rejects the heresies of Ecumenism, Modernism, and Sergianism. Ecumenism teaches that the Orthodox Christian Church is not the one and only True Church; it proclaims that the 'union of the churches' is 'not impeded by dogmatic' differences, in contravention to the teachings of the Holy Scriptures and Fathers. It further says that joint-prayers and services with the non-Orthodox, and sharing of the Sacraments with them is acceptable. All of these statements are incompatible with Orthodox Christianity; because we seek to preserve the Faith, and to teach men to follow Christ in truth, we cannot abide by a false love which does not seek to explain that men must be part of the Lord's Church. 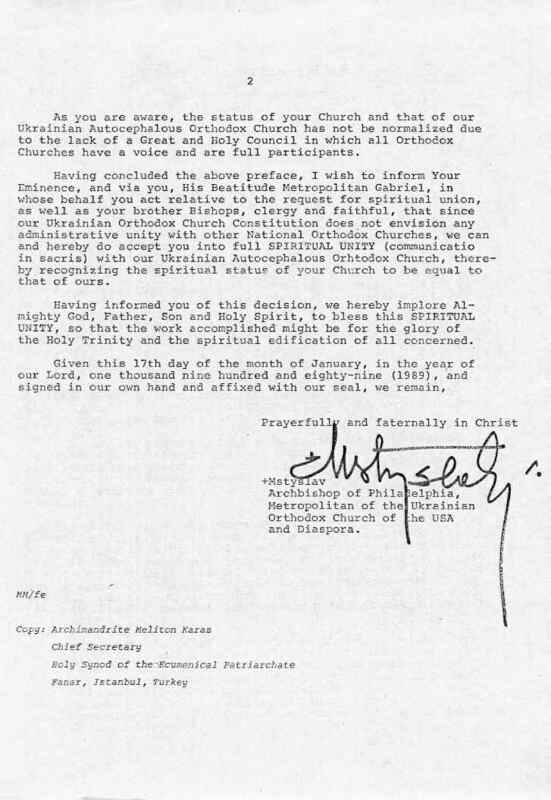 It is not out of hatred to the non-Orthodox that we refuse joint-prayers and services with them, but, as the Apostles, Fathers, and Saints taught, out of a desire to safeguard our ownselves from corruption of doctrine and practice, and, to serve as a testimony to all who will listen or observe, that the Church is One in Faith, and all must accept the Truth of Christ's Orthodox Church for salvation. For this reason, the Orthodox Church condemns the heresy of Ecumenism in all its forms, and the Holy Synod of our Metropolia resists this heresy, and our Bishops will not abide it. The heresy of Modernism is also condemned as detrimental to the Orthodox Christian Faith. Modernism teaches that the books of the Holy Scriptures are full of the most base errors and deviations, lies, fables, fictions, mixed with some truth. Modernism teaches that the Traditions of the Church are not to be trust, even though approved by the Holy Ecumenical Councils and locally approved Councils, as well as Modernism casting doubt on the authority of the united consensus of the Fathers and the liturgical books of the Church. Modernism is a spirit that teaches that 'modern man' knows better than the countless Saints in terms of the Truths of the Orthodox Christian Faith. Thus, while there may be minor scribal errors in copying manuscripts, the Fathers have never taken such mere human mistakes as reasons to deny the veracity of the Scriptures as an whole. The same approach of the Saints must be taken as to the other parts of the Tradition of the Church; although we may find mistakes of copyists here or there, in terms of the works of the Fathers, etc., this does not deny the veracity of their teachings as an whole. Modernism has also been called "Renovationism". Sergianism is the evil teaching that the Church can be subject to atheist God-hating authority, and that the Church can proclaim that the 'joys' of such so-called authorities are the 'joy's of the Church; a proposition which stands in open conflict with all basic premises of moral and doctrinal order. This is most famously represented in the soi-disant Patriarch of Moscow, Sergius. It was amidst the assaults of all these heresies and their infiltration into the Orthodox Church in various stages (led by Freemasons, often), that a great revival and movement of the Orthodox Christians transpired, in Greece, Russia, and Romania. Eventually this movement spread to the Americas, Western Europe, and beyond. In Greece, the Ecumenical Patriarchate the State Church of Greece, forgetting the old Tradition of the Fathers, sought for the reasons of Ecumenism and Modernism, to impose the Gregorian New Calendar upon the Orthodox Christian Church. This change was opposed by the faithful and laity, monastics, clergy, and some Bishops. This 'reform' of the Calendar had previous been condemned by the Church for centuries. In the 1920 Encyclical of Constantinople, entitled "To the Churches of Christ Everywhere", the modernist-ecumenists proclaimed that the New Calendar was to be forced upon the Orthodox Church in order to unite with the heterodox. By the 1930s, Orthodox Christian Bishops in Greece, along with multitudes of clergy, laity, and monastics, had, after years of pleading with the innovating hierarchs, been forced by necessity to separate and wall-themselves off from the offending hierarchs. However, by the 1950s and 1960s, due to persecution and interntal conflicts, the True Orthodox Christians of Greece were in danger, since the majority no longer had Bishops. It was at this time that Bishops of the Russian Church Abroad decided to aid them. They consecrated additional Bishop for the True Orthodox (Old Calendar) Greek Church in 1962, the first of which was the well-known Archbishop Akakios, who became the first hierarch of the Greek Church. 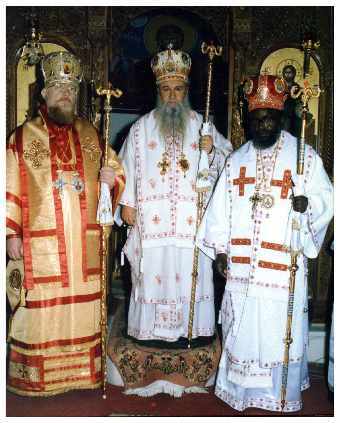 By 1969 the Russian Church Abroad and the True Orthodox Christian (Old Calendar) Church of Greece had entered into formal, full, and open communion. during the tenure of the successor to Archbishop Akakios, the Archbishop Auxentios. The communion was based upon their common opposition to Ecumenism, Modernism, and Sergianism. Elsewhere in the world, in Romania, Russia, Georgia, and other lands, similar struggles were underway. We now enter into the history of our Synod proper. The gradual establishment of Traditional Orthodox communities, formed primarily of converts in the West, was a fact not lost on Archbishop Auxentios of Athens (+1994), who first established a West European Diocese in 1978 with the election of Archimandrite Gabriel to the Episcopate of Lisbon. Six years later, a second Bishop, Tiago of Lisbon was established for Western Europe. Again, on the 9th and the 23rd of September (Old Style), as well as September 30th, the Bishops elevated Bishop Evlogius to the See of Milan, Italy, and Bishop Gregorio (Bacolini) to the see of Turin, Italy, as well as Bishop Theodore of Evora. Below is the mandate in Portuegese issued for the Consecration of Bishop Evlogius of Milan, as well as the photo of his consecration to the episcopacy. With this blessing, the Synod of the West grew well beyond its boundaries in Portugal at a rapid rate, while the Synod in Greece began to fall apart through repeated schisms. 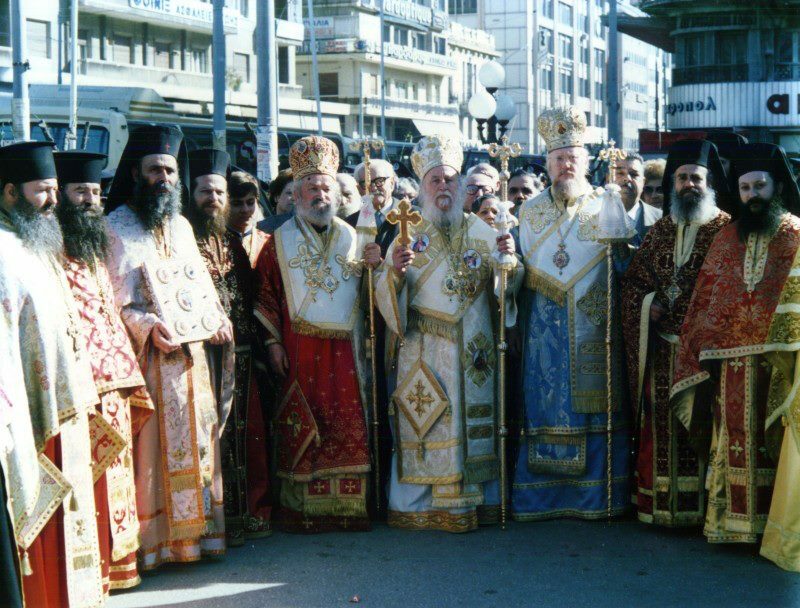 Fearing that the disturbances then rocking the True Orthodox Church in Greece would spill over into the Western European Diocese, Archbishop Auxentios, on September 27th, 1984, issues a Tomos of Autonomy to the Western European Bishops. Archbishop Auxetnios of Athens personally wrote the Tomos himself with his own hand. Below is an image of the Greek original, and then an English translation. of the GOC of Greece. With this blessing, the Synod of the West grew well beyond its boundaries in Portugal at a rapid rate, while the Synod in Greece began to fall apart through repeated schisms. Despite this, the Autonomous Orthodox Synod in the West continued to recognize Archbishop Auxentios as the legitimate True Orthodox Christian Archbishop of Athens. At the same time, the our Synod maintained is missionary attitude to the spread of Orthodoxy among the peoples of the West who ancestors had been Orthodox 1,000 years ago, while not neglecting friendship and aid to peoples who come ethnic groups that had maintained Orthodox in the past few centuries, such as Russians, Greeks, Ukrainians, and others. Above all things, our Synod was and is a missionary Synod. 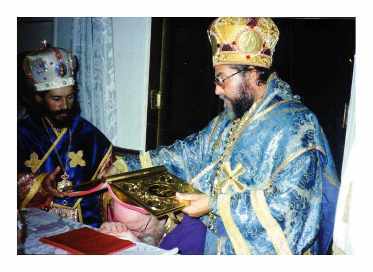 In 1990, the Western Synod elevated Bishop Evlogios of Milan to be Metropolitan, confirming the re-establishment of an Orthodox Episcopate in the see of St Ambrose for the first time since the schism of the West. The new Archbishop of Milan was chosen as Primate of the Synod of the West (hence the popular title “Milan Synod”) and became known for its stance against ecumenism as well as her frequent use of pre-schism Western services, something which was not well-understood within the Old Calendar community. However, Metropolitan Gabriel and his bishops in Portugal departed to World Orthodoxy, leaving the new Synod with the need to have a new Metropolitan to lead it. 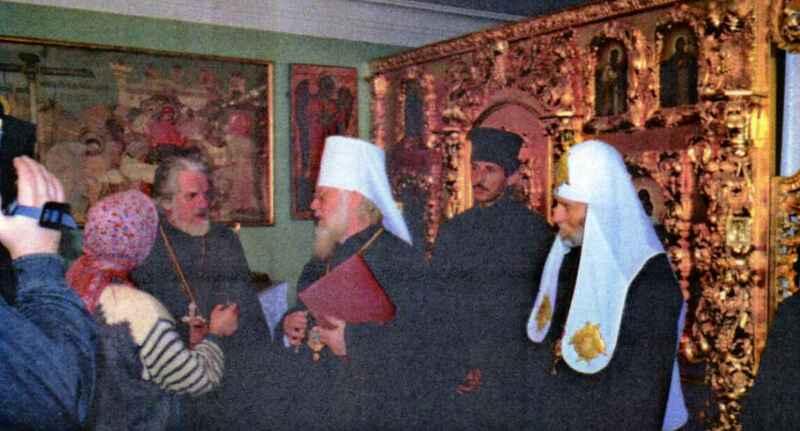 In 1989, the Western Synod entered into communion with Metropolitan Mystyslav of the Ukrainian Orthodox Church in Exile, which in 1991 became the Orthodox Patriarchate of Kyiv. 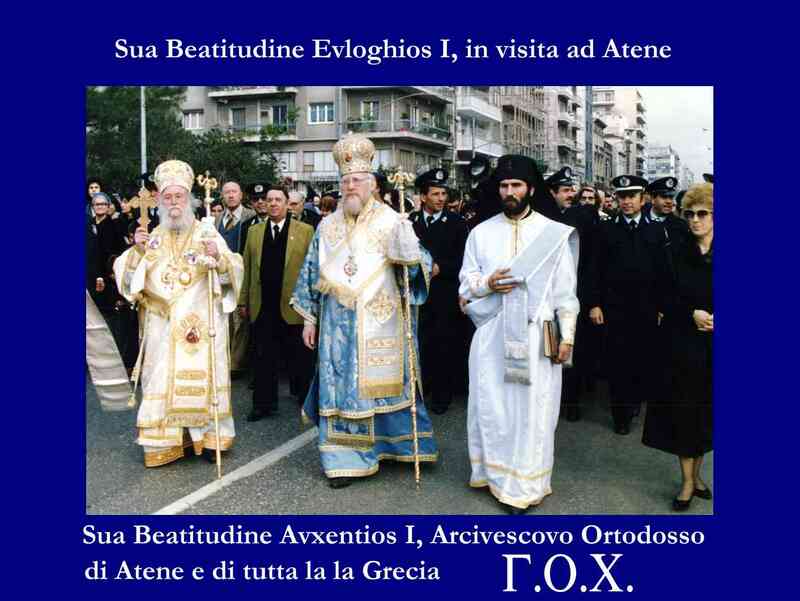 At the same time the Synod was seeking to establish communion with other Orthodox Churches, it did not forget that it to maintain its relationship with the True Orthodox Church of Greece. 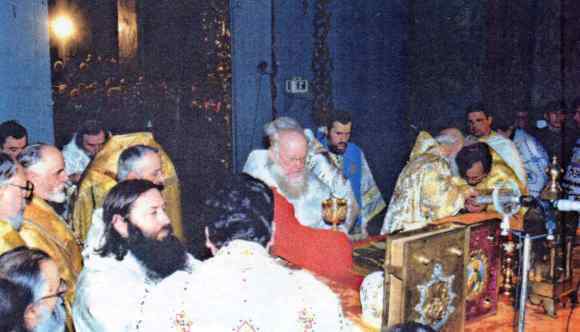 Metropolitan Evloghios visited and concelebrated with Archbishop Auxentions of Athens until his repose in 1994. Several visits were made, but, ultimately, the situation among the different fragmented Synods in Greece proved too difficult in that age to overcome. As such, the our Orthodox Church continued to maintain communion only with Archbishop Auxentios, learning a valuable lesson about the unfortunate and conflicting ecclesiastical situation after the various schisms. In 1994, Patriarch Volodymyr, a former dissident clergyman , recognized the autonomy granted by Archbishop Auxentios and confirmed it with his blessing before his death in 1995. Despite the relationship with foreign Orthodox Churches in Greece and the former Soviet Union, the Synod maintained it firm missionary stance. This resulted in an event that would later provide safety for our Church amidst the rocky assaults on Orthodoxy that were to come. In 1997, our Synod was petitioned by a small independent jurisdiction in the United States with two American bishops with their communities. 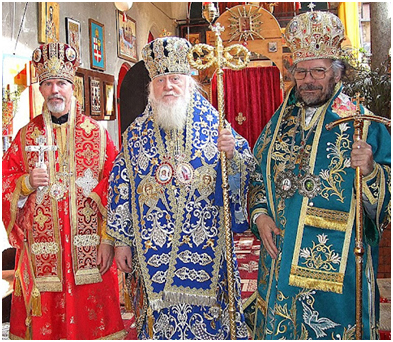 These American bishops we know as the current Metropolitan John and Archbishop Hilarion. These two bishops had been part of a small independent organization. We have to be careful not to conflate the history of this previous organization (i.e. “Synod of Orthodox Bishops of the Western Rite”) with Our Synod. 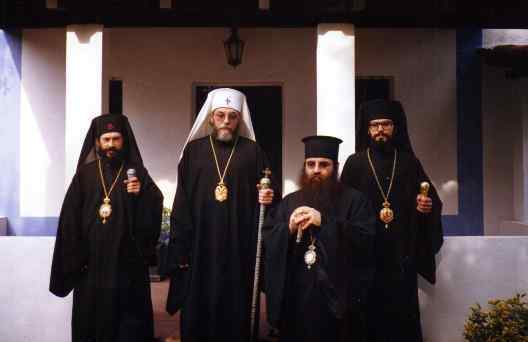 The American bishops petitioned to the Autonomous Orthodox Metropolia to receive Correctional Ordination, or Cherothesia (i.e. the essential ordination prayers were read over them again, and the American bishop in turn read the same Cherothesia prayers over their American and British clergy, in a short rite, as opposed to the full service). Cherothesia is a form of reception of clergy which is used for clergy who, although possessing certainly the external forms and rites of ordination and succession, a question is still made about their canonical status. In the Orthodox Church, to resolve these questions in dealing with bishops and clergy who have this canonical problem, the rite of cherothesia is applied to remove any doubt; although, in many instances in Church history, the form of reception has sometimes been more lenient or more stringent depending upon the occasions, times, and circumstances. The issue of the Orthodox Western Rite became an important part of the self-identify of the American Bishops. Indeed, Metropolitan Evloghios, although later having become mostly Byzantine rite, had originally made heavy usage of the Gallican and Ambrosian rites. The distinct history of the successful liturgical work to restore Western Orthodox heritage is often untold. Because of the former backgrounds of many of the clergy who came to Orthodox via her Western rite, these clergy had developed an heavily anti-ecumenist and anti-modernist bent, and thus, they were easily able to agree with the struggle against ecumenism happening in the wider Orthodox world. While many Roman Catholics, disaffected with Papal modernism, ecumenism, and liberalism, would attempt to form Sedevacantist and other mini-papalist organizations, many became Orthodox and sought to the fullness of their historical heritage. We will examine in another section of the website this story in fuller detail. Below are the Certificates for the Cherothesia of Archbishop Hilarion and Metropolitan John. As such, our Synod maintains a traditional Orthodox (pre-Schism) Western rite, and opposes the usage of modern Roman Catholic and Anglican services in to Orthodox. This does not mean an exclusive use of the Orthodox Western rite, anymore than we endorse an exclusive use of the Byzantine Orthodox ritual. Both derive from Saints and Fathers, and are to be respected as long as they are done according to the manner and method of Orthodox Christian Saints who used them, abiding by the Dogmatic and Canonical Constitution of the Church. Following this Tomos of Autonomy, however, Metropolitan Evloghios, under the influence of a Bishop Abundius of Como, declared that he was severing communion with the Autonomous Orthodox Metropolia of North and South America and the British Isles, as well as several Greek Bishops in Greece that he was in communion with him. He then applied to join the Moscow Patriarchate. During this time, many appeals were made to him to renounce this course and re-establish communion with his former Sister Synods. This prompted Metropolitan John to release a Clergy Confession containing a concise statement of our Synod on key issues concerning Orthodox Christianity. After what looked like an initial hope of Metropolitan Evloghios reconciling with his Sister Synods, the hope was soon shattered in early 2012. At this point, there was no hope of re-establishing Communion. The Moscow Patriarchate instructed Milan to transfer all of their churches in Italy into the jurisdiction of the Moscow Patriarchate, and, at the end, Metropolitan Evloghios would be accepted. Later Metropolitan Evloghios was convinced by Bishop Abundius that they should renounce their Episcopal orders and ask only to be received as archimandrites. 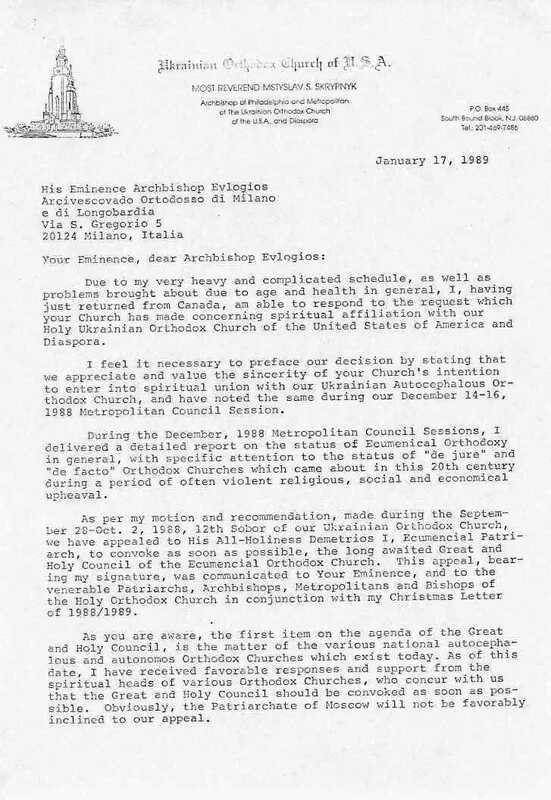 Finally, after most of their Churches had been turned over to the MP, having broken Communion with all their Sister Synods (including our newly Autonomous Orthodox Metropolia of the Americas and British Isles), Milan’s clergy in Italy were told they would not be received by the MP as clergy, but only as simple monks, after they agreed to sign over the main church in Milan and all other property to the Moscow Patriarchate. However, during this period, and despite these sad events, our Autonomous Metropolia in the Americas, now on its own after the disintegration Milan, grew. 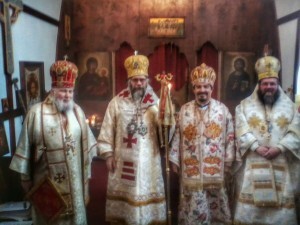 On Sunday, January 30 (OS) / February 12 (NS), His Grace, Bp CHRISTODOULOS of Miami and Cuba was consecrated by His Beatitude, Metropolitan JOHN of New York and Bp FANOURIUS of Lincoln at the Holy Archangels Parish of Lincoln, NE, with the assent of Archbishop HILARION of Texas, who could not attend. Later that year, on August 12 OS / August 25 NS, a Synod meeting and gathering of clergy of our Autonomous Orthodox Christian Metropolia was held on Mt. Overlook, Woodstock, NY, at the parish church of Holy Transfiguration. For a more detailed report of the discussion, see the “Report on the Meeting of Bishops and Clergy”. 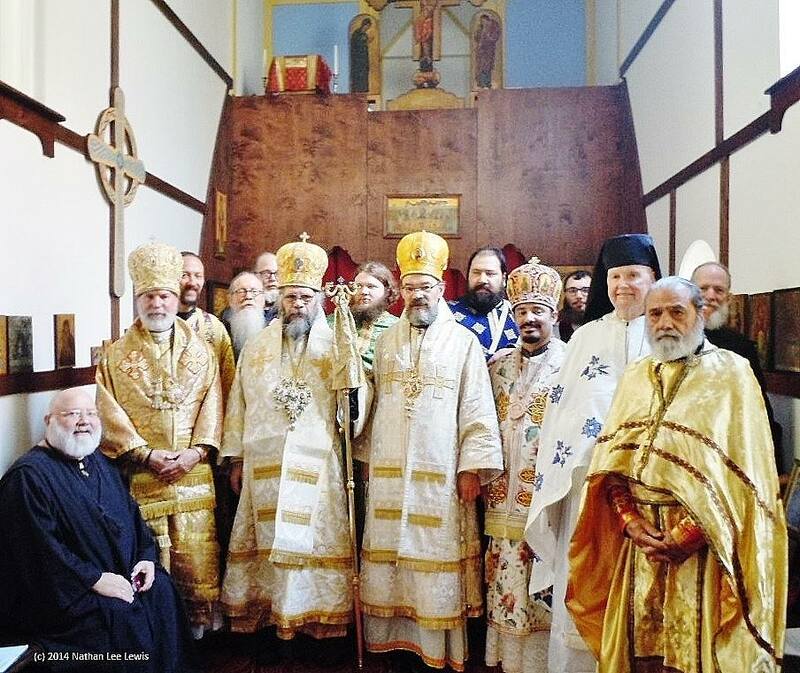 On August 13 OS / August 26 NS, our current Archbishop Joseph of Edmonton, and our former Bishop Seraphim of Manhattan were received in our Metropolia through the rite of Cherothesia. Archbishop Joseph of Edmonton, Canada. In 2013, after their negotiations had totally failed with the Moscow Patriarchate, having destroyed the vast majority of any work accomplished in Italy, the former Metropolitan Evloghios and former Bishop Abundius, announced that they had ‘resumed’ the episcopate. However, before this had been done, Metropolitan John had issued a tomos to the only Bishop in Italy that had not gone along with Metropolitan Evloghios’ submission to the Moscow Patriarchate. This last remaining Bishop was Metropolitan Onuphrius. 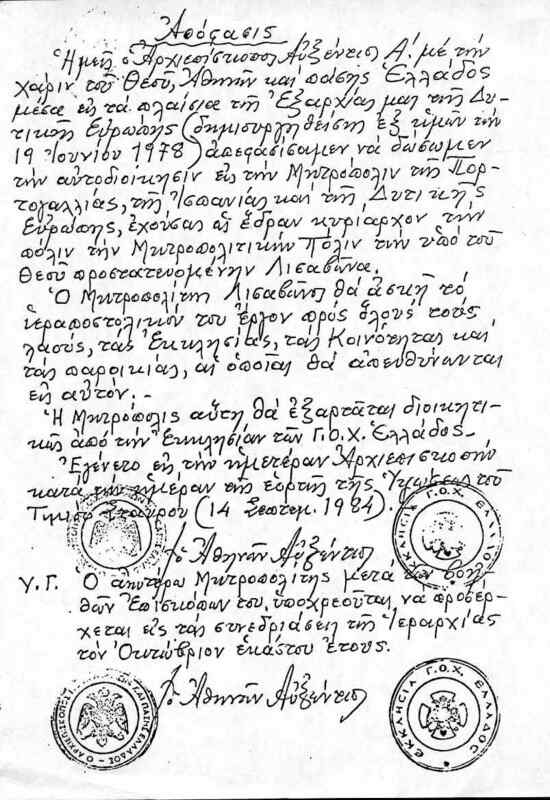 In fact, Metropolitan Evloghios had signed over all the legal titles and names of his Metropolia to Metropolitan Onuphrius. However, the situation in Italy, even with Metropolitan Onuphrius, proved problematic since, and the restoration of communion between Our Metropolia and Metropolitan Onuphrius has not been accomplished at this time. At this point, the ‘resumed Synod’ of the former Metropolitan Evloghios and Bishop Abundius, instructed that all the former Synods they had been in communion with were to submit to them or be ‘deposed’. In the United States and Canada, the reaction was one of simple disbelief in such a statement. As a result, a detailed canonical analysis and statement were issued on the position of the former Metropolitan Evloghios and Bishop Abundius, stating that because they had renounced their Orders in an attempt to join the Moscow Patriarchate, they had committed blasphemy according to the Apostolic Canons and Canons of the Ecumenical Councils, and thus, could not simply ‘resume’ their Orders. The report was issued by our Metropolia’s Committee for Inter-Orthodox and External Church Relations, on September 27 (OS) / October 10 (NS), 2013, chaired by the Metropolitan, with Hieromonk Enoch, Deacon Finbarr Brandt-Sorheim, and Deacon Joseph Suaiden also sitting on the Committee, with the approval of the Synod of Bishops. Metropolitan John, in fact, remains currently the only Orthodox Bishop who lives according to the Orthodox Western Rite at the Abbey of the Holy Name, with the monastics of the Abbey. During this also, the Autonomous Orthodox Metropolia of North and South America had entered into communion with a Russian jurisdiction under a certain Metropolitan Raphael (Prokofiev). The impetus to enter into communion with this jurisdiction derived from the aforementioned Greek bishops, under a Metropolitan Angelos of Avlona. The Synod in the United State and Canada, trusting in the research and work conducted by Metropolitan Angelos and his Synod, entered into Communion in Summer of 2012 with the Russian jurisdiction of Metropolitan Raphael, which called its self the True Orthodox Church of Russia. However, questions began to surface later in 2012 in the American Metropolia over the past of Metropolitan Raphael and the accusation of his former connection to supposed occultic practices. Inquiries were made, and an investigation, however, had revealed that none of these seemed to arrive from sources that could be considered credible (i.e. either Moscow Patriarchate accusers, or accusers from True Orthodox jurisdictions we had no communion with). Additionally, a statement had been issued in which Metropolitan Raphael stated he condemned any occultic activities and he was not engaged in it. However, in summer of 2014, a new critical situation emerged over the Russian jurisdiction of Metropolitan Raphael. In summer of 2014, Metropolitan Raphael began to meet with the well-known heretical writer, Gregory Louriye. 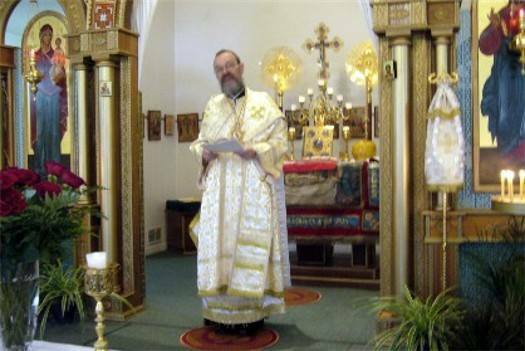 Gregory Louriye had been a member of the ROAC (Russian Orthodox Autonomous Church), the largest of the True Orthodox Christian Churches in Russian. However, he had been deposed by the ROAC for the heresy of Imiaslavism. Imiaslavism was (and is) an heresy condemned in 1912 and 1913 in Constantinople, Mt. Athos, and Moscow. Imiaslvists taught that the Holy Name of Our Lord Jesus Christ was itself Divine and Uncreated and God. The teaching was that the Name of Jesus was to be given divine adoration like the Holy Trinity. However, the teaching was condemned by the Russian Orthodox Church and the Orthodox Patriarchate of Constantinople; this condemnation was even confirmed continuously in the 1920s and 1930s by the great continuer of the Russian Orthodox tradition, Metropolitan Anthony (Khrapovitsky), the First Hierarch of the ROCOR. ROCOR thus continued to affirm the decisions of the pre-Revolutionary Russian Church on this doctrinal matter, although heretical Imiaslavists would do all they could to deny this. This prompted our Metropolia to issue a statement making clear its position at this dangerous time. 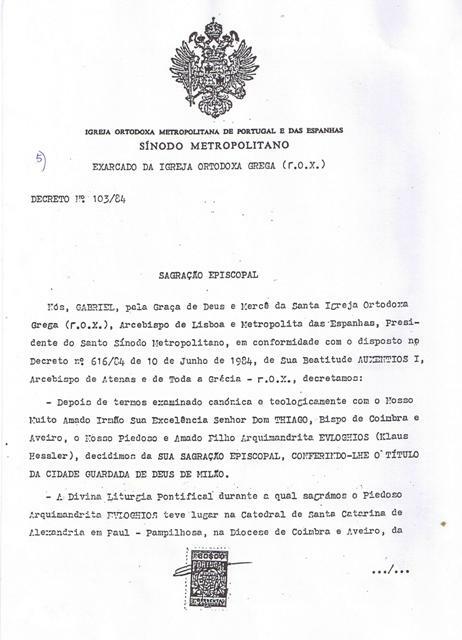 In July of 2014, at a Sobor of Metropolitan Raphael’s jurisdiction, a document was issued. For the most part the document was Orthodox, EXCEPT, for its affirmation of the heretical Imiaslavist doctrine. This was a cause of utmost concern for clergy in the United States and Canada. Inquiries were made through the intermediaries of the Greek Synod of Metropolitan Angelos. Initial denials were made stating the document was not official; others said the ‘website of the Russian Metropolia was not under Metropolitan Raphael’s control’. By late December of 2014 letters had been exchanged with Metropolitan Raphael over this manner, two such responses can be viewed here (1 and 2), along with the refutation of this false teaching, with a statement issued in early August. However, claims continued to surfaces from Greece that the letters were not written by Metropolitan Raphael, or that they were ‘distorted’. In October of 2014, the Synod of Bishops of the Autonomous Orthodox Metropolia of North and South America, frustrated at the attempts to establish with certainty what was transpiring, decided to adopt an anathema against the Name-Worship, or Imiaslavist, doctrine. This quickly provoked a reaction by the Russian jurisdiction of Metropolitan Raphael, and the heretical Imiaslavists. They issued a statement after Holy Nativity stating they were not in communion with our Synod. Relations with the Greek Synod of Metropolitan Angelos, however, turned negative; after what initially looked like an agreement with our position, the Greek Synod, sadly, was led to take the position that Imiaslavism was not an heresy. Shortly after Pascha of 2015, Archbishop Porphyrios, the representative of Metropolitan Angelos, stated that the Greek Synod no longer held communion with the Autonomous Orthodox Metropolia. 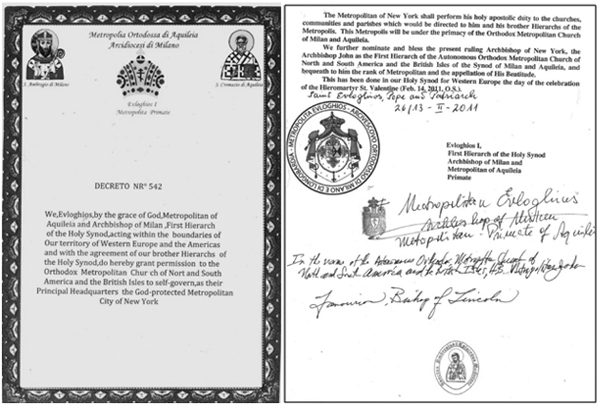 Later in the summer of 2015, Metropolitan Angelos sent a letter to Metropolitan Raphael affirming that they accepted the Imiaslavist doctrine (after previously stating they had not), and condemned the American Metropolia for refusing to assent to the Name-Worship heresy. Despite the great controversies that have sadly cut off Sister Synods from Our Church, before this time, and during it, Our Church continued to experience growth. Our Synod held another important Synodal meeting in October of 2014, where Bishop Joseph of Edmonton was formally elevated to the rank of Archbishop. This was preceded earlier that summer by the reception of several Orthodox Ukrainian communities, and a priest, from the jurisdiction of the Ecumenical Patriarchate. Archbishop Joseph’s work continues to grow and open traditional and True Orthodoxy to the Ukrainian, and other communities in Western Canada. The 2014 Synod meeting proved the second time that our Bishops and Clergy were able to gather together. The Synod of Bishops as of October 2014. 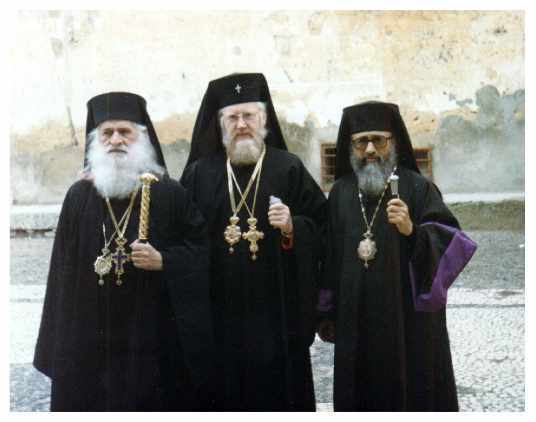 From left to right are Bishop Phanurios of Lincoln, Nebraska, Metropolitan John of New York and New Jersey, and Bishop Christodolous of Miami. Also present were several clergy, monastic, and laity. 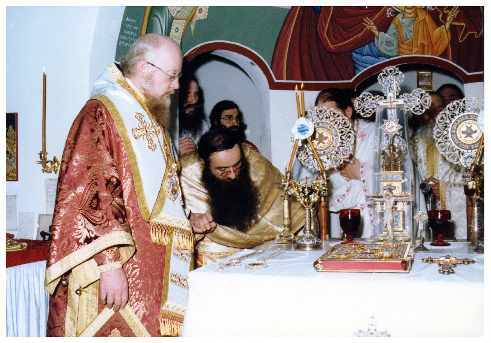 Our Metropolia continues to allow and promote the usage of the Orthodox Western Rite in the strict context of dogmatic and canonical obedience, as all Orthodox liturgical usages must be. 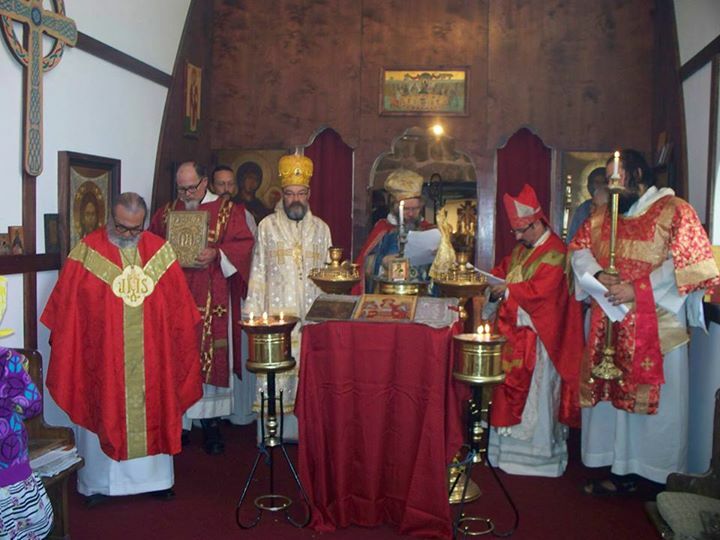 At the October Synod meeting, while the Eastern Liturgy of St. John Chrysostom was celebrated on a Saturday, the Orthodox Western Liturgy was celebrated, as always on Sundays and other days. Metropolitan John also continued to encourage Orthodox Christian missionary work, with many small missions experiencing growth in California, Texas, Alabama, Florida, as well as eastern Canada and the British Isles. Additionally, by permission of the Synod, on December 21st, 2014 (OS / January 3rd, 2015 (NS), two additional Bishops were received through Cherothesia. The two bishops received were the retired Archbishop Philip (Cain) of Philadelphia, and the vicar Bishop Alexios (Blumer) of Hazleton and Weatherly. The Autonomous Orthodox Metropolia of North and South America and the British Isles stands for the fullness of the Orthodox Christian Faith, and thus is commonly identified as True Orthodox. The Metropolia thus condemns the heresies of ecumenism, modernism, and Sergianism, and seeks to convert all peoples to the True Orthodox Christian Faith and Praxis. Our Metropolia is noticeable for allowing and promoting the usages of the Orthodox Eastern and Western Rites within the Canonical and Dogmatic Traditions of the Orthodox Christian Faith, and is an open home for all those seeking traditional Orthodoxy, whether they come from a background that has recent ethnic ties to Orthodoxy, or those whose ancestors were anciently Orthodox, or those who have no Orthodox heritage. The Gospel is for all people, of whatever ancestry. Our Metropolia seeks the conversion of all to Orthodox Christianity. The Gospel of Jesus Christ, the Apostolic Teachings, are for all people who seek salvation and obedience to God and His Church.